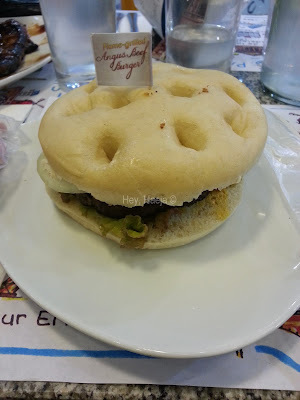 I love trying out different burgers, as long as they’re affordable, so when we went to French Baker, I decided to try out their Angus Beef Burger. I thought I ordered the whole plate with the potatoes and salad on the side (P295), but the cashier just entered the burger itself. The burger costs P215. When the Angus Beef Burger was served, the server handed me two plastics with the French Baker logo. One was clearly a wet wipe towelette. I thought the other one was just mistakenly handed to me, but I opened it anyway and was really glad to discover that they provided me with plastic gloves! Now, I don’t really require gloves to eat a burger, but I already had so many experiences of eating burgers with the sauce dripping down, leaving my fingers smelling afterwards, so the gloves were a nice touch. The gloves were a bit big for me, so I know it will fit bigger hands. I hope they have other sizes, though, for really big hands. The Angus Beef Burger up close. 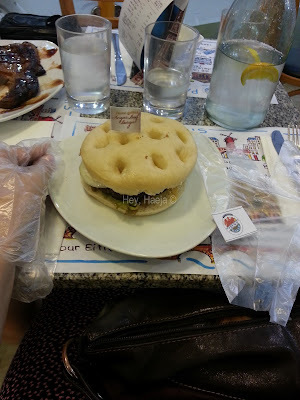 We saw the angus beef burger patty grilled, with flames really shooting up high. The bread was toasted but tasted a little dry. Aside from the patty, the Angus Beef Burger also had onions, tomatoes, lettuce, and mustard sauce. 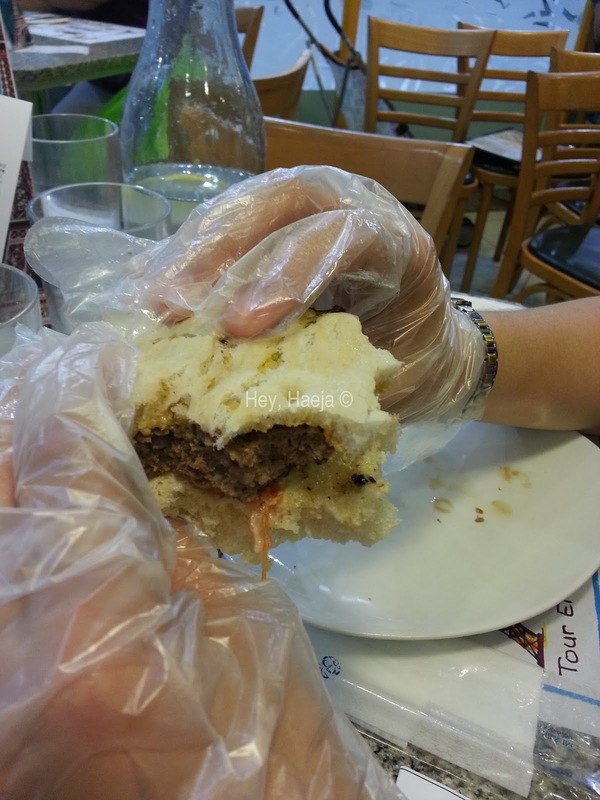 The patty itself was thick and tasty. The burger isn’t too thick so it wasn’t hard to bite into it, unlike other burgers that I had to slice the patty in the middle and separate the buns just so I can eat. The buns were firm when the dish was served, but the juices and the mustard sauce smeared on the patty soaked through the bottom bun and it became a little soggy. I flipped the burger over, which made it easier to hold as the bottom bun was breaking apart. The top bun held its consistency and didn’t break. The burger didn’t fall to pieces on my plate like the other burgers I’ve tried. I don’t know why there are holes in the top bun, maybe for decoration? All in all, it was a good and tasty patty, but the burger as a whole didn’t leave me wanting for more of it. It was definitely filling, but it’s not in my list of favorite burgers.